A novel perspective on the psychology of healing is revealed from the vantage point of authentic experience as author Melva Freeman releases her debut title, "Tools for Stability"(published by Xlibris). This self-help manual offers a wealth of information regarding the progression of mental illness, tested management techniques, medication and intervention strategies, all drawn from 25 years of living in the cage of bipolar disorder. 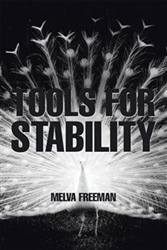 In "Tools for Stability," Freeman recounts her personal bout with mental illness and how the odds encouraged her to direct her fate into a positive direction. It contains tools for effective anger management,stress management, working with treatment personnel, dealing with medication, tips on saving treatment costs and even finding compatible people with whom to share recovery with haste. Overcoming mental challenges, Freeman says, involves a good deal of trial and error, determination and persistent will. She aims to share in this book, the same knowledge that took her 25 years to learn from first-hand experience. The insider's viewpoint presented in this self-help manual easily offers patients' families, friends and treatment experts a leeway to understand the underlying troubles that their mentally-challenged loved ones are going through. In a similar way, it offers people with identical circumstances, the consoling knowledge that they are not alone in their battle. The insights revealed appeal not only to the patient-psychologist range but also to society in general. "'Tools for Stability' is a positive book and perhaps a life roadmap for people who are experiencing some similar situations,” says Marilyn P., an advocate of Independent Living for People with Disabilities. “Melva herself shares a positive outcome in her own successful life, letting others be aware that they too, can recover. Melva was courageous to write and share this book and did it so well." Melva Freeman is a California-based writer. She has two grown children and seven grandchildren. She works part time at the Disability Services and Legal Center, an independent living center that helps people with disabilities live with independence. She currently resides in Rohnert Park, in a senior living apartment with the royal ambiance of a luxury hotel.